The BMW M5 is a four-door, five passenger sport sedan. The BMW M5 was for many years a sedan without parallel in North America. The only mid to full-size four door to consistently display a 100 horsepower advantage over the competition, the M5 was also notable for setting itself apart from the Mercedes AMG cars by offering a manual transmission. It also provided a vehicle whose suspension made the car feel as though it were half its actual size, providing both outstanding comfort and incredible performance. The BMW M5 continues the tradition of innovation, high-technology and rocket ship performance which has defined this line of cars. Hiding under the hood is the most powerful engine ever installed in an M car – and the first with ten cylinders. Displacing 5.0 liters, the engine generates 500 horsepower and 383 ft-lb of torque. This astonishing amount of power can be controlled through either a 7-speed SMG semi-automatic transmission or a traditional 6-speed manual. BMW claims that the SMG transmission can shift gears in only 80 milliseconds, making it much faster than a human driver. The 4,000 lb car has a computer-controlled top speed of 155 miles per hour, and accelerates to 60 miles per hour in only 4.5 seconds. The spectacular performance is not limited to the engine output. Large 14-inch brake rotors front and back are more than up to the task of clawing the M5 back down from triple-digit speeds in a hurry. Dynamic Stability Control and a variably locking rear differential help to keep the M5 firmly planted during high-speed cornering, as do electronically controlled shock absorbers which can react to the driving situation in order to provide the correct balance between comfort and stiffness. Of course, it wouldn’t be a BMW without heaps of luxury features, bells and whistles. The telephone interface system is voice activated, allowing for hands-free dialing and answering, as is the navigation system – which is also constantly updated with new traffic information to help you avoid jams and accidents. The M5 is also capable of projecting the vehicle’s speed as well as directions from the navigation system onto the windshield at eye level, which allows drivers to keep their eyes on the road and still access important information. The interior is plush and wrapped in the highest-quality leather and materials, and there is ample space in the rear passenger area for taller adults making it a comfortable car even on long trips. The stereo system is also superb, although many people will likely forgo the radio so that they can listen to the intoxicating sounds of the M5’s intake and exhaust when working hard. The BMW M5 is a sports car disguised in the body of a sedan, and is a perfect vehicle for those who desire speed without all of the attention and flash that comes with a Porsche or a Ferrari. The ability to seat more than two people also works to the M5’s advantage when it comes to convincing family members that this sedan is actually a practical purchase, and not just motivated by an animal passion for power and speed. 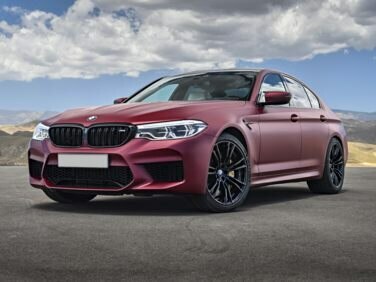 The BMW M5 continues to dominate the full-size sport sedan market in North America with this worthy addition to the vehicle’s lineage. The 2009 BMW M5 is a carryover from 2008. The 2009 M5 is a hot-rod version of the standard 5-Series sedan and is available is a single trim. The M5 crams a 5.0 liter, 500 horsepower V10 engine under the hood. This unit also generates 383 lb-ft of torque, and can be ordered with either a 7-speed automatic transmission with manual shift control or a 6-speed manual gearbox. Fuel economy for this land rocket is rated at 11 miles per gallon in the city and 17 miles per gallon on the highway.